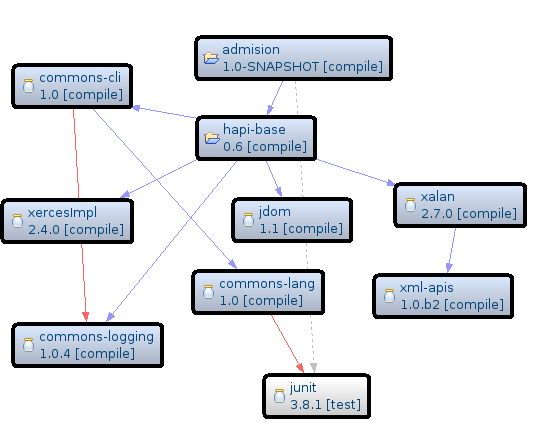 Well, I use maven to organize and automatically download project dependencies, basically open source libraries. where your project is the top one. Uncompress it somewhere in the hard disk, create the enviroment variable home M2_HOME to the uncompressed folder. THen go to: Window > Preferences > Maven > Installations in eclipse and add your recently donwloaded and uncompressed maven installation, select it. Then, you’ll see how eclipse(maven in the background) automatically download the project dependencies under the “Maven dependencies” category that you can check directly in the pom.xml (the file that actually defines a maven project). And you can check your own maven local repository at> $home/.m2/repository, in windows c:/Documents and Settings/User/.m2/repository. Well, I have just a few months with maven, and I’m realizing it is more than a management/build manager, it is fully extensible with your own plugins, allowing you to do almost anything with/from your project sources. Furthermore, migrating an eclipse/netbeans/etc native project to maven is not too hard, it is usually no more than create a pom.xml file, place there your own project dependencies and move your sources to /maven_project/src/main/java, the resources (log4j.properties, etc) to /maven_project/src/main/resources and unit tests to /maven_project/src/test/java.